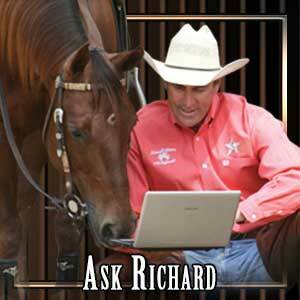 ​How do you get your horse to cross muddy areas, or a ditch and creek with water? Rosetta J. 1. Make the right thing easy and the wrong thing difficult. 2. Be firm as necessary and gentle as possible. 3. Reward the slightest try. When you ask your horse to go forward through an area that he is hesitant about, it is important to keep your focus and not allow your horse to whirl around in circles. If your horse tries to go left - immediately send him back to the right. You can bring up the pressure with your legs and or a spanking and clucking. Be sure and take all of the pressure off if and when your horse takes a forward step. They will often want to put their head down and sniff the water or muddy area. Make sure he doesn't run into bit pressure when he attempts to do that. These are the little tries that need to be rewarded. Sometimes having another horse that you are able to follow can help the apprehensive horse be a little braver and more willing. Some water crossings are more ominous than others. Try to start off with little challenges where the footing is good and you and your horse can stay safe. I hope some of these ideas help. You might enjoy our horsemanship DVD course entitled “Making the Equine Connection” which takes you through a myriad of exercises that can help you develop a more trusting and respectful relationship with your horse. You can check it out online. I am a new viewer of your cable show and have learned a lot from it. I am a part time rider. I do not own a horse, but rent one from a near by stables. The horses available are quarter horses. I have had no formal riding training, and have worked hard to learn what I could on my own. Do different breeds have softer trots and lopes? I feel very, very comfortable and confident trail riding, but when I move the horse into a trot I bounce very hard into the saddle. This is also true in the Lope. I watch other riders, you and your daughter very closely to see what movements you make to make the trot and lope more comfortable and enjoyable. I notice that you post, is this customary in the trot? I also notice a pelvic thrust while in the lope. Am I correct on that? The owner of the stables tells me to just sit in the saddle and let my upper body absorb the shock. The problem with this is, the muscle soreness the next days. I really like riding, but have grown very frustrated, that after several years of riding, have not improved my trot and loping saddle. I don't want to abandon my riding. Can you suggest training videos I can watch, or can you describe what I need to do while in the saddle? I desperately need your guidance. Great to hear from you Paul! Many people have found that gaited horses (such as Tennessee Walkers, Peruvian Paso’s, Paso Fino’s, etc.) are the best alternative to find a smoother ride. Beyond that, within each breed, individual horses will naturally have smoother or rougher gaits, depending on their frame and way of moving. If you are going to stick with a standard breed then there is no substitute for practice and saddle time. Posting is a great mechanism to make the trot more comfortable for you and your horse. It’s certainly not used exclusively in English riding. When trotting: Your up and down motion has to be in time with your horses gait. As he is trotting along you can feel his footfalls, one two, one two, one two. Now your hind end needs to go up and down at the same speed, (meeting the saddle with rhythm) up down, up down, up down. If you are a little bit slow or a little fast, you will be out of rhythm. The faster the horse trots, the faster you have to rise up and sit down. I would suggest that you keep slight pressure in your stirrup with the balls of your feet, pushing up and then sitting down at every stride. If he is trotting very slow (i.e. jogging) it’s most practical to sit the jog while just keeping slight pressure in your stirrup with the balls of your feet. When loping: The body movement should be primarily in our hips and pelvis. A rolling motion in that area allows our legs and upper body to stay relatively still. Don’t be afraid to hold onto the saddle horn for a while if that helps you maintain your balance. A lot of transitions between the walk, trot, and lope are also very helpful in teaching our body the muscle memory and rhythm necessary to ride these gaits. How is your posture? Regardless of what gait we are in, we need to sit up and keep our shoulders above our hips. Leaning too far forward or too far back will only hinder progress. Again there is no substitute for consistent practice. You’d be a great candidate for our week long “Ultimate Horse Course – July 4-10.” Please check it out at www.wintersranch.com! We really enjoy your TV show! I was impressed with your horsemanship. I do have a little problem with a young mare I have. She is almost 5 years old, a good smart horse, I have owned her for a few months. She has a little problem (as most do) when we ride away from the barn/corral she rides nice and then after a mile or sometimes sooner she decides she’s had enough and turns around. Of course I stop her and begin to turn her back on track but she gets mad, may buck, kick and back up crazy like. What I am currently doing, as of todays ride, is just pulling on the reigns and saying whoa very calmly. She does stop! Then after waiting for a few seconds I get her to head back in the right direction. This does seem to work but she will do this every few minutes or so. Am I doing the right thing? She does try to please but I think someone before me let her go home. Anyway... thanks for the great show. Keep your focus. Look where you want to go. If she veers left immediately drawl her back to the right. Don't allow any full circles. Remember, she always has to go back the way she left. When she gets stuck, it's probably not the time for whoa. It's the time to go! Stopping is more in line with what she wants to do. Keep your focus and drive her forward. That might mean with your legs or it might mean with a spanking. Don't forget the underlying principle "Make the right thing easy and the wrong thing difficult." Try working her around the barn yard and then riding out and away and resting. A little reverse psychology can be helpful! Now that I am a little older, I feel like I've lost a lot of the confidence I had as a young rider. I love my horse but sometimes she exhibits behaviors that intimidate me. I've come off of her twice and I'm not sure that I even have the confidence to get back on her again. Do you have any suggestions? If it's any consolation, you're not the only one who deals with this issue. The best thing that I've found to overcome fear is having the proper understanding and tools in our hands to deal with each situation. Also having a series of positive experiences that can build our confidence. One thing you should probably ask yourself right now is, "Can my current horse be brave for me and help me overcome my fears?" or "Do I have a horse that I need to be brave for to help them overcome their fears?" You need to make sure your equine partner is suited to your current specific needs.Now is the time to seek some professional help. Perhaps there is a qualified instructor or trainer in your area who could help objectively evaluate you and your horse. A horsemanship clinic venue could also help equip you to be the kind of leader your horse needs. Often times trouble arises when signs are missed and steps are omitted. An instructor or clinician can help you understand what your horse is telling you and give you a systematic approach to dealing with your horse that can remove some of these variables that get us into trouble. There is also the possibility that your equine professional will tell you that this is not the horse that is best suited for you at this time in your life. Not every horse and rider are a match. Be realistic and open minded. With a good support system and guidance there is no reason why you can't enjoy a healthy and confidence filled horsemanship experience! I hope that some of these ideas will be helpful. Thanks for asking!